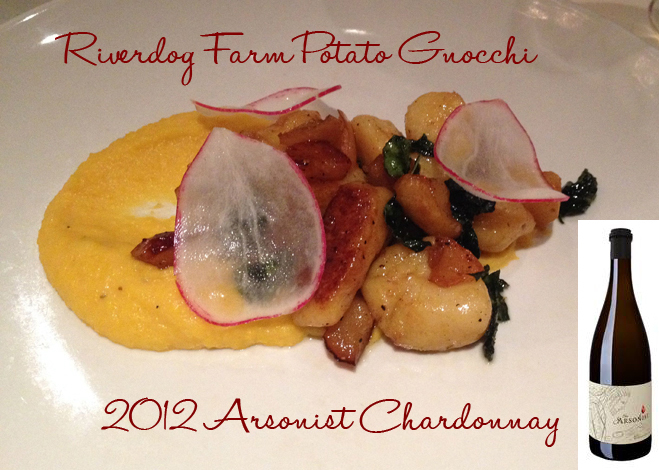 Farm to Fork Wine Dinner Series: Piatti Presents Matchbook Wines, Spectacular from Beginning to End! 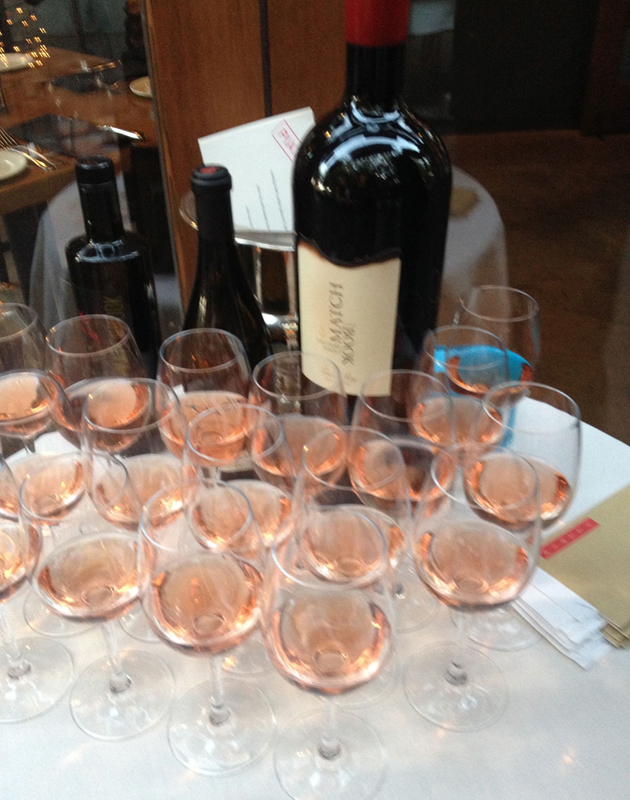 If you missed Piatti’s last wine dinner for the year featuring Matchbook Wines, I feel really bad for you! It was even more than I thought it would be––even though I knew it would be amazing. Piatti is one of my long time advertisers, and I have always been a fan of their food, but I never knew it could be pulled off like this. This dinner was probably one of the best meals I have eaten there. I think it’s mostly due to Chef Lance Carlini who combines his take on Italian cuisine with Farm to Fork/seasonal and brings it to a whole new level. 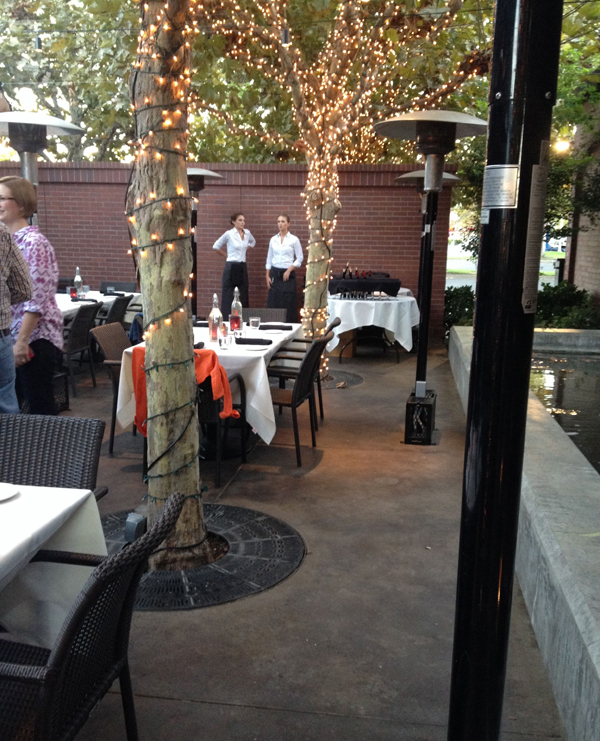 We were sat fountain side with illuminated trees surrounding us. We had been welcomed with an opening glass of Matchbook’s Rosé of Tempranillo as John and Lane Giguiere (owners of the winery) were making the rounds and introducing themselves to each table. Then it was onto the opening dish: A wood fired spot prawn with Grass Valley polenta and a hatch chili chimichurri. 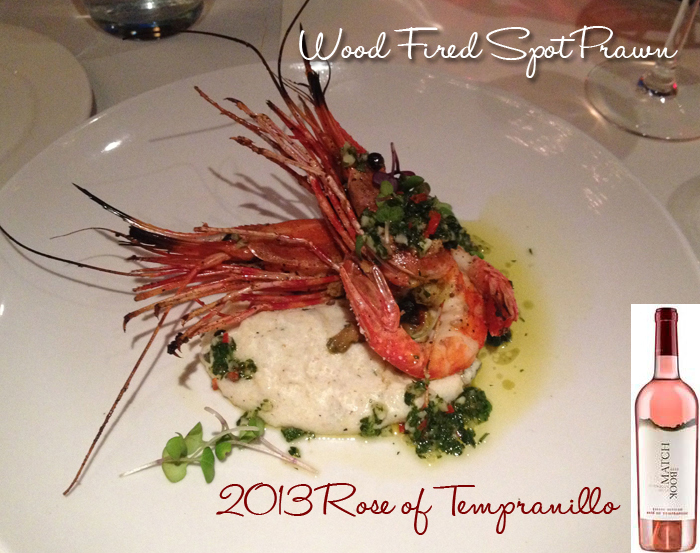 It was paired with the wine we were already enjoying: Matchbook’s 2013 Rose of Tempranillo, Dunnigan Hills. As you can see. the plating was flawless on this dish. My favorite element was the chimichurri (a green sauce made of chopped parsley, minced garlic, olive oil, oregano, and white or red wine vinegar) which I love on anything from seafood to chicken to beef or pork. Then it was time to get serious. 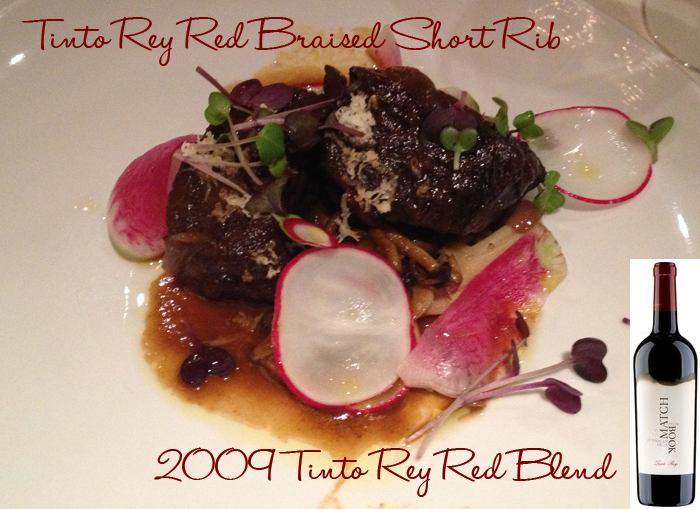 The third course presented to us was a Tinto Rey Red Braised Short Rib with Thyme Toasted Mushrooms and fresh Horseradish paired with the 2009 Tinto Rey Red Blend, California. The Tinto Rey is a red wine blend of Tempranillo, Syrah, Graciano, Tannat and Cabernet. So, if you didn’t gather from the course description, the short rib was actually braised in the wine with which it was paired. We didn’t even really need a knife on this one, just a fork to pull apart the meat. Again, the plating was gorgeous and the pairing was genius. Dessert came soon after that: A Milk Chocolate Mousse with Chocolate Cake, Sea Salt Caramel and Hazelnut––topped with Pomegranate arils. It was paired with the 2012 Cabernet Sauvignon, Lake County. 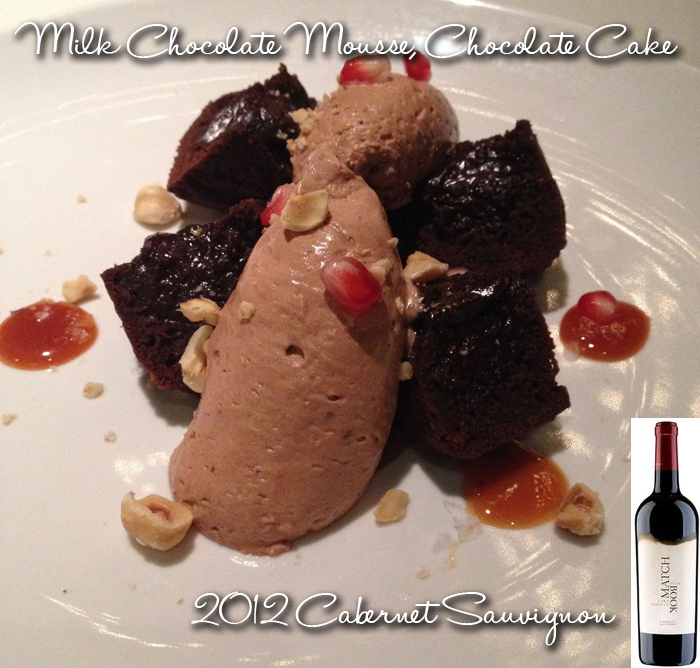 I boxed up the dessert to take home to Andy, but took full advantage of the Cabernet. 🙂 The Matchbook Cabernet Sauvignon has vibrant ripe red fruit characteristics followed by layers of spice and earth and chocolate and that’s enough dessert for me! You can learn more about Matchbook Wines here. You can find them on Facebook here and their parent company on twitter here. You can find Piatti on Facebook here and follow them on twitter here. This entry was posted on October 29, 2014 by cavegrrl. It was filed under events, food, restaurant, Uncategorized, wine, wine tasting and was tagged with events, Farm to Fork Wine Series, food, Matchbook Wines, Piatti, wine, wine tasting.